To make a Five point ribbon flower. 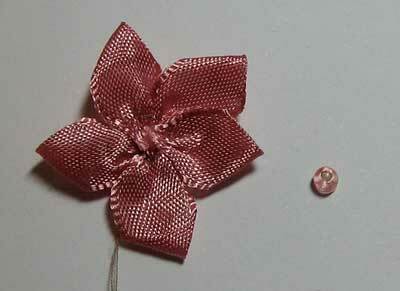 The sample is made from 13 mm ribbon but you can use ribbon from 8mm to quite large to make this type of flower. 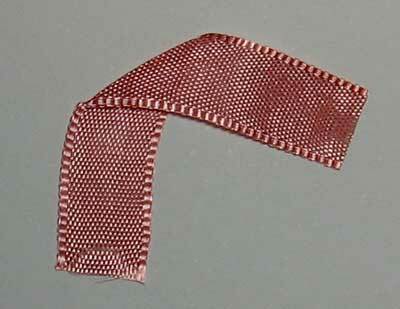 It looks good in silk ribbon, satin ribbon and ribbon made of organza. 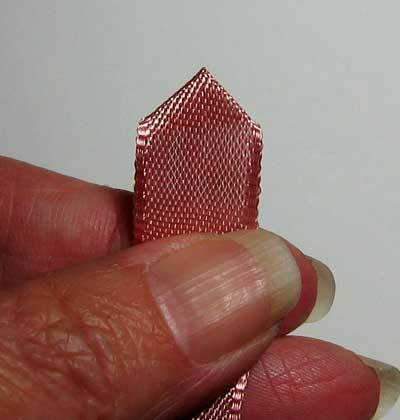 Cut a piece about 3/4 inch long and fold it at right angles so that it forms a mitre corner as illustrated. 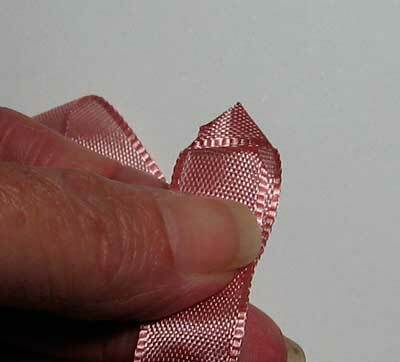 Fold the ribbon back on the mitre, so you are folding the ribbon back underneath itself. 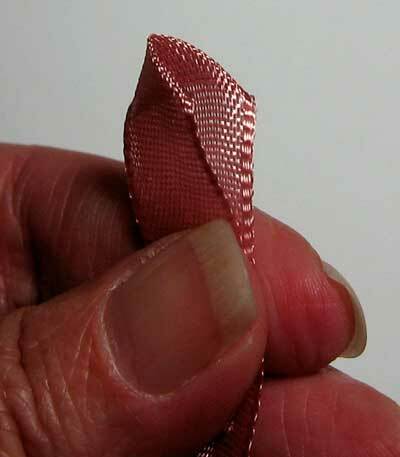 Finger press the top edge. You will have a front and back. Make five petals and have them ready to thread together. About half way down ribbon gather the first petal on the needle and then trim the excess ribbon off. 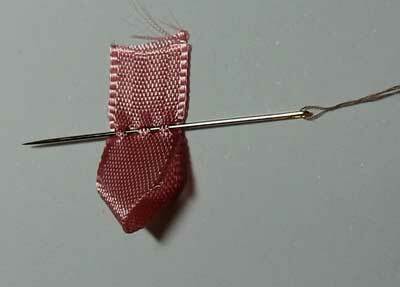 Do this with the five petals gathering them on the needle. 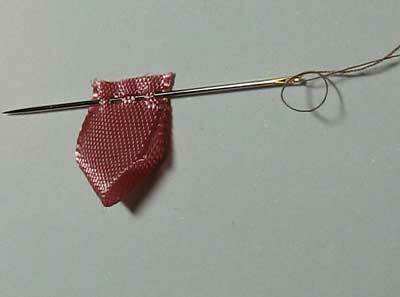 Pull the thread tight and finish off at the back. Add a bead for the centre. You have a 5 pointed ribbon flower to add to your next project! I'm from Malaysia.I just made one for my niece.It's so lovely,thanks a lot. WOW! These are just stunning! TFS! Thank you for a wonderfully clear and simple tutorial for a gorgeous flower. I'll just have to have a go at making some (for my handmade cards) yours turned out so well and they are not something that could suffer in transit! This is a great project! I love the ribbon flower, I think with the tutorial you have here, I can definitely make one for myself as well. Thanks a lot. I have been looking for a way to do this for awhile now! THANK YOU SOOO MUCH! Oh my gosh your flower is gorgeous! Thanks so much for sharing this wonderful tutorial! Sharon,This is too much of coincidence as I am bumping into SRE.I joined the SRE group in stitching fingers and bumped into a blog in the same .Now I just wanted to check chain stitch variations and here again I am seeing this ribbon flower.Thanks a lot for the clear tutorial. Oh, I love this tutorial! Simply beautiful. Thank you very much to teach how to do this flower! I’m SO delighted to have found your perfect ribbon flower tutorial! I linked to this post from my paper-crafting blog – your instructions are so easy and well organized! Thanks for the beautiful inspiration! thank you for sharing! 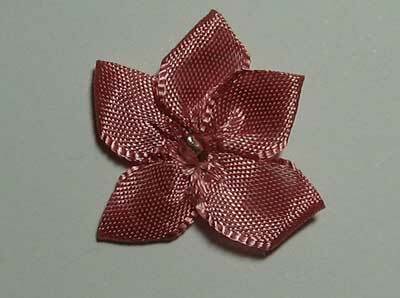 i’m looking for how-to make ribbon flowers to put on bobby pins for Christmas gifts, and found you. wow !!!!!! thank for left handers tips!! I just made one of these. Your instructions were so clear and easy to follow. I used baby blue organza, and put a pearl in the center. It is sooooo pretty. Thank you for the great tutorial. I’d appreciate your letting me know if that’s OK.
Nice skills, thanks for sharing with us! Nice tutorial..will try it some time later…. I think I want to make lots of these to “sprinkle” on the new curtains I made for my daughter’s room. Thanks for the clear instructions with excellent sharp photos. I made a large one to adorn the front of my baby’s Christening dress as the store didn’t have any large enough nor in the ivory color I wanted. Plus mine is made with soft satin ribbon and not the scratchy stuff the store flowers use. Wonderful tutorial! Thanks so much for this, just what I need. So simple yet so beautiful! Thank you for sharing. We are starting a challenge blog, for all forms of arts and crafts and would love to invite you to be a guest designer, for one challenge. Each challenge has sponsored prizes and designers recieve a small pack of sample goodies to play with. Oh, thank you very much. Fantastic!!! Beautiful work Sharon!…even the lurkers like me are inspired…I finished a small quilt for my godson that I was making for his baptism and 2 quickie ones for his brothers so they will not be jealous. My best friend was shocked to see the floor of my sewing room… Keep that inspiration up! p.s. My best friend was visiting because I am working on 2 4-tier skirts for her…most of the way finished. Hmmmm…maybe I will weigh all the projects that leave and see what it totals…. Please contact me off line. have an interesting site for you. Great tutorial… thanks Ms. Sharon!!! Have a wonderful weekend! Thanks this is beautiful. Very easy tutorial to follow. Merci beaucoup, très intéressant les “tuto” en images.